The Insanity Cards crowd sale is drawing to a close. With a little less than 48 hours left to go we’ve unlocked a 23% discount! If you want to get a copy, now is the time, and the more of us that buy them the lower the price gets for everyone. I thought in honor of the final push I’d take a moment to review how to use Insanity Cards in various RPGs. For many RPGs it’s really as simple as following the instructions that come with the cards (free download here). This of course assumes either the system you’re using has no insanity mechanic, or that you’re completely replacing the existing mechanic with the cards. But for those systems that already have a mechanic, let’s dig into the details of how to use the cards in a complementary way. Note, when approaching healing or recovery, I often recommend “discard a card in play”. What I’m talking about here is to remove one descent from an existing insanity, effectively reducing the effect (say from a level 3 Delusion to a level 2 Delusion), or even discarding the Tell if it has no Descents. I list Savage Worlds first because I run most of my horror RPGs these days using Savage Worlds. These are mostly one-shot games where I completely replace the existing fear mechanic with the cards. 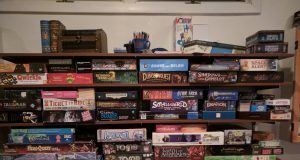 I trim out some rules that I think don’t mesh well with horror games – I eliminate the soak roll, bennies, and the shaken status. I also drop the Guts skill in favor of just drawing cards. I know that’s a lot. Basically I’m using Savage Worlds just for skills and attributes, plus a very quick miniature-less combat that is pretty darn deadly without all those saving elements I ripped out like soaking and shaken. This fits well with my style of game – about half the game is investigation with few physical threats, then the latter half the game quickly devolves into death and mayhem. But let’s assume you want to run an ongoing campaign and use the cards. I would leave the Fear rules as is, and just replace the Fear Effects table with the cards. Any failed Guts check from Fear is worth a card, any failed Terror check or a natural 1 on a Guts roll is maybe worth 2 or 3 cards. I would generally rule any 1-2 point insanity as a minor hinderance, and any 3+ insanity as a major hinderance. If you wanted to let players start with one of these during character creation, I might say draw and play 2 cards as a minor hinderance, or 5 cards for a major. I would also probably allow players to discard 2 cars from play for an advance, assuming you want the ability to heal insanity. Depending on the setting, that may require time spent at an asylum or in therapy as well. Chaosium’s Call of Cthulhu is a little harder, as it already has a pretty complex insanity system. To be honest, this is actually a turn off for me with this system, so I’d really be inclined to ditch all that complexity and just use the cards. But again if you’re pacing out an ongoing campaign, I think you could do something simple like map 5 insanity damage to a card. Basically, for every 5 points of sanity you lose draw a card, and for every 5 sanity you gain you can discard a card in play. I would also recommend that a character who reaches 1/5 of their maximum sanity is no longer allowed to play Tells, and a character who reaches 0 sanity must immediately push their highest level insanity to 5 (just draw and play descents on a single insanity until it’s at 5). I have not played enough Warhammer FRPG 3rd edition to make recommendations here, but I have played a ton of 2nd, so here we go. Actually, this one is super easy: 1 insanity point = 1 card. Done. Record insanity points on your character sheet as normal, and start making willpower tests once reach 6 points. If you fail the test, lose 6 insanity points, and draw and play 6 cards. So it’s still a 1-for-1, but you get that cliff effect Warhammer FRPG has. Still, I think I’d prefer just doling out cards and not record the points at all. And of course, for any of the insanity healing, follow the rules as written in the book, and for every point healed the player can discard a card in play. I wanted to list D&D here, and actually I think d20 modern is a great fit for horror games in non-fantasy settings. But, you’ll note, none of these games have actual insanity rules. So, yeah, just use the Insanity Cards Rules as written. Easy. Dread is a great horror game, and I adore the reflected tension of the tower. I think working Insanity Cards into a Dread game is not too hard. You could simply layer the cards on top with no direct interaction with the tower. Alternately, any time the character witnesses something terrifying, tell the player how many cards they must draw, and allow them to reduce the number of cards with a tower pull on a one-for-one basis. If they knock the tower over during this, they must draw the original number of cards specified. Maybe in that case also add the extra penalty of limiting the number of Tells they’re allowed to play to one or even zero (assuming they have some Tells in play already). Fate is another game where I’d be pretty close to just using the cards as is. One obvious addition is to simply consider any face up Insanity Card as an aspect of that character. I’m not sure if you’d want to use Tells in this way or not, I’d have to play-test it. UPDATE: After writing the above it struck me that rather than just using the card itself as an aspect, you could use the bolded title of each level of insanity as an aspect. Thus, a player with level 3 Paranoia would have the additional aspects of What Was That?, My Things!, and Not Sure About That Guy. Now I kind of want to run a Fate game with these things. There are plenty of other systems out there that you could drop Insanity Cards into without requiring any additional thought. Most RPGs that don’t have an insanity mechanic you don’t really need to worry about – just layer the cards on top of the existing system. If you have an interesting one that needs a little more effort, or have other ideas for how to incorporate Insanity Cards into existing RPG systems, I’d love to hear your thoughts.